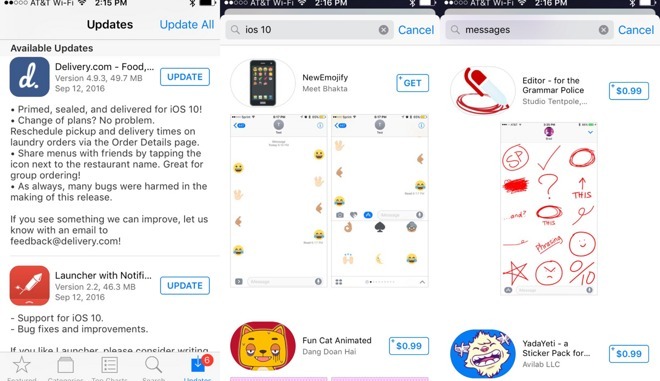 Ahead of this Tuesday's launch of iOS 10, Apple has begun allowing apps designed for the new operating system onto the App Store, including downloads that tap into the new Messages integration feature. Starting Monday afternoon, apps updated for iOS 10 began arriving on the App Store. Apple first began asking for iOS 10 app submissions last Wednesday, following the golden master release of the update. Once users update to iOS 10 (the first release is actually numbered iOS 10.0.1), a new right-facing arrow will be seen in the Messages app. Tap it to expand and show three options, one of which is the App Store icon. Selecting the Messages App Store shows already-installed options, including recently used apps. Tap the four dots to the left to see all installed apps, as well as a link to the digital storefront in the form of a plus. 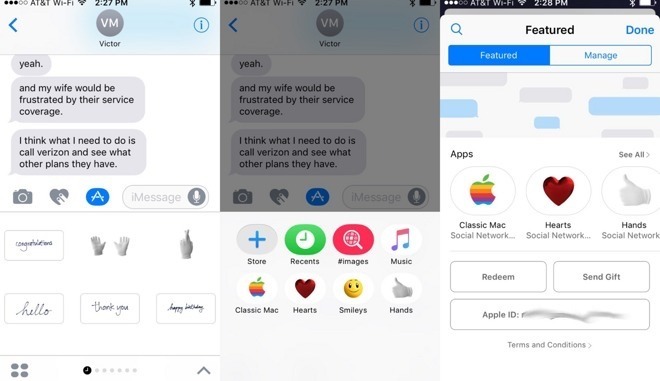 Once opened, the Messages App Store presents itself in a pop-over window, with hints of the Messages app residing in the background. At the moment, as of Monday, the only "Featured" apps are Apple's own options: Classic Mac, Hearts, Hands and Smileys. With iOS 10 apps now available to submit, users can tap the search magnifying glass icon in the upper left corner. Messages-compatible apps are displayed in a familiar list view. As with the traditional iOS App Store, Messages apps can be free or paid. They can operate similarly to third-party keyboards, Safari extensions and Apple Watch apps —in some cases they are installed in a traditional manner, complete with an app icon, even though they also plug into native apps and devices. However, some Messages-only apps do not have home screen icons. The Messages App Store also includes a "Manage" tab for easily adding or removing third-party apps. Apple has included an "Automatically Add Apps" feature to ensure that new options are integrated into Messages after being downloaded, with no additional user input needed. Beyond Messages, third-party apps in iOS 10 will also offer integration with Siri, and developers will be able to create lock screen widgets. The update launches to the public, along with watchOS 3 and tvOS 10, this Tuesday.